How does that old saying about closure and new beginnings go? It’s something along the lines of when one door closes, another opens. That, in a nutshell, is what No Surrender is really all about. 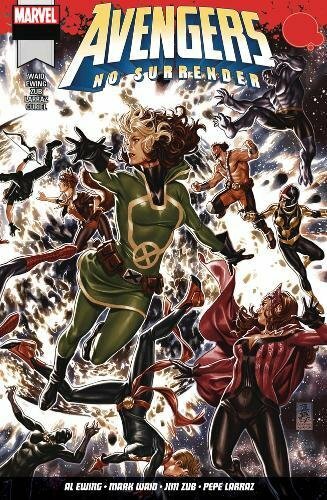 Acknowledging the vast impact that the most famous Superhero team in four colour history and its ever expanding membership has had on the Marvel Universe, while creating a definitive end point and a new dawn for the team. No Surrender is a huge, character driven story that ties up, and finally closes the curtain on, a number of the loose ends that have beset some of the biggest and brightest members of the team. When I say huge, I mean in terms of the personal stories of the players who take centre stage throughout the events in No Surrender and not the plot that guides them from the outset through to the culmination of the tale. That’s relatively straight forward and involves a pair of feuding celestials / elder beings, their chosen squads of incredibly powerful super beings cobbled together from all corners of the Universe, the Earth being hijacked and the Avengers having to combat the “gods” and their goons and save the world and everyone on it from the threat of yet another planet ending disaster. There’s more to No Surrender than that my rather simplistic take on the story. In a book this size ( and it’s pretty darn big) how could there not be? But I’m kind of a stickler about spoilers, so I’ll just say this. Treachery, infamy, deception and incapacitation. Oh and death. There is I’m afraid to say, as there always are in major crossover and big comic book events, the usual fallen warriors. Not everyone who charges into battle at the start of No Surrender makes it to the end, so before you start reading, make sure you’ve got a box of Kleenex because you might just need them before you finish No Surrender. But like I said, as one door closes, another opens and as one (or more than one) hero falls, another returns to the fold. Because if you’re going to go big in a major comic book event, you go really big and bring back the biggest gun there is. And that ladies and gentlemen is all that all I’m going to say about that. No, it really is, because you know, spoilers.